It’s Wednesday. Time for What’s Up Wednesday, a blog hop created by Jaime and Erin Funk to help writers connect. I just finished Sorcery and Cecelia by Patricia Wrede and Caroline Stevermer. Loved it. I haven’t really settled on what’s going to be next. Still working on the rewrite of THE IGNORED PROPHECY. 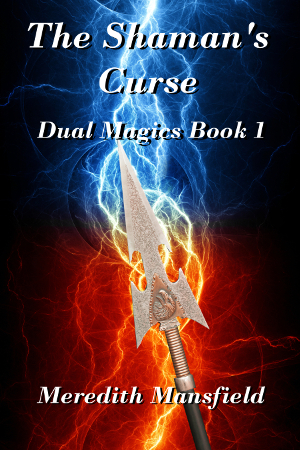 It’s the sequel to THE SHAMAN’S CURSE, which launches next Monday. Eep! I’ve been a little hung up on a kissing scene. I had to remind myself that this one is light epic fantasy/sword and sorcery. This scene doesn’t need the same emphasis I’d give it in say a YA book. I also just started the querying process on DAUGHTER OF THE DISGRACED KING, a YA fantasy romance. Right now, the deadline I’ve set for myself. I want to have THE IGNORED PROPHECY ready to publish in December. Most of what I got done yesterday was wrangling the two dogs down to the vet for their annual exams. Poor Aliza (13 1/2 years old) had to have her ears washed out. Who knew wax build up was a problem for older dogs? Aliza is the red-head. Micah’s the one using her for a pillow. He’s only 10 1/2. Thanks. Yeah, you can just tell that Aliza (who was up there first) wasn’t exactly thrilled to have Micah decide to join her, can’t you? Good luck with the launch and querying! Congrats on the upcoming launch! And poor doggies…we used to have a Beagle, and her ears were always giving her trouble! 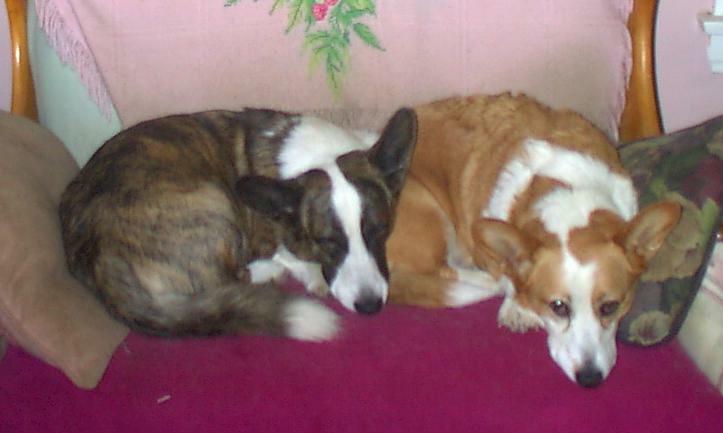 The dogs (Cardigan Welsh corgis) have really been pretty healthy all around. Aliza has low thyroid and had a bout of gallbladder trouble a couple of years ago. This is the first time either of them have had ear problems. Well, one of them had a foxtail removed several years ago, but other than that . . . Kissing scenes can be a real pain in the arse sometimes, can’t they? Your dogs are adorable! Kissing scenes: Sometimes they just work. Sometimes you have to work at them. Awww, cute dogs! And yay for launches. Epic stuff. Good luck with your launch and nailing that kissing scene! Your fur babies are adorable. Hope you have a stellar week! I am inspired by how many projects you are juggling at once, each at different stages. That is impressive and it must leave your head spinning some days! Best of luck with the big launch ahead, the querying, and meeting your deadline. You’re rocking it! Congrats on the launch! Your doggies are adorable. They look like good buddies. 🙂 Have a great week! Thanks on both counts. Yeah, they get along very well for the most part.